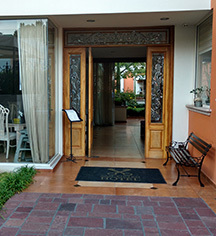 Hotel San Pietro was originally built as a house by architect Alejandro Zohn in 1952. Zohn was born in Vienna, Austria and moved to Mexico with his family due to the war. Zohn spent his childhood in Tlaquepaque among family and friends. Zohn studied at the Universidad de Guadalajara. After finishing his degree in engineering and architecture, he returned to Tlaquepaque and built a collection of houses located on the main avenue. His signature style was pure and organic, following the simplicity of the spaces according to the natural environment upon where it is built. He wanted to build just as the nature does, with freedom and harmony. The work of Alejandro Zohn is so important to the region, that he is frequently honored in print and in scholarship. The National Museum of Architecture in the Palace of Fine Arts curated and displayed the exhibit “Alejandro Zohn 1930-2000” in 2011. The house found its first owner when it was purchased by Fernando Silva Sahagún in 1955. Sahagún was the mayor of the City of Tlaquepaque in 1940 when he was just 26 years old. Afterward, he had a remarkable and distinguished 68 year career as a notary, including being the Dean of Notaries for several years. In 1952, Sahagún founded the Rotary Club in Tlaquepaque. He was better known as " Hechicero" by the members of the Club. He became an illustrious figure after his death in 2009. 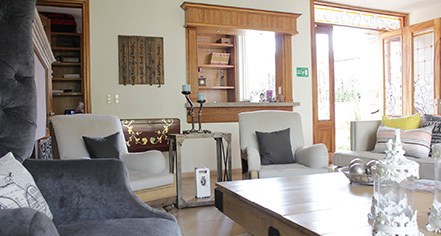 Bought by the current owners in 2012, the renovated Hotel San Pietro began welcoming guests in 2014. Notable attractions near the hotel include Museo Regional de la Ceramica, Catedral Metropolitana, and Instituto Cultural Cabanas, a World Heritage Site. Hotel San Pietro, a member of Historic Hotels Worldwide since 2016, dates back to 1952.